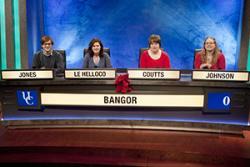 Bangor University's University Challenge team.Congratulations to the University’s new season University Challenge team who won their first televised round against Aberystwyth University, in the most difficult of tv quiz shows, broadcast last night (Monday 14 October on BBC 2). The team performed well, showing an all-round knowledge of the arts, science, sport and general knowledge and being quick on the buzzer to gain the extra questions, winning the match with a substantial lead of 230 against Aberystwyth University's score of 110, in what was being described as a 'Welsh universities Derby match'. Their win follows last year’s highly successful team, who reached the semi-final round of the show. That team have handed their lucky mascot, Rhodri the Dragon, to the new team. 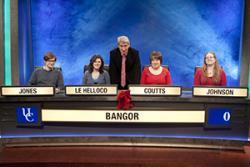 "It was great to see Bangor soundly beat Aber, our varsity partners, on national TV. I watched with our team, and I'm so proud of how well they did!" The team members who responded so successfully were: Catriona Coutts (captain), Owain Wyn Jones, Daisy Le Helloco and Anna Johnson, with Tom White as reserve team member. The University Challenge team with question master, Jeremy Paxman.Rhodri’s not the only member with University Challenge experience, as Team captain Catriona Coutts, from Gaerwen, Anglesey, was reserve member for last year’s Team. She is 24 and is studying English Literature with Creative Writing and is a former pupil of Ysgol David Hughes, Menai Bridge, Anglesey. Catriona said: "Taking part was an amazing experience; exciting, scary and surreal in equal parts! It was also interesting to see how things worked in the studio. Everyone working on the programme was really nice and went out of their way to make us feel relaxed and comfortable." Other team members are: Twenty-six year old Owain Wyn Jones, who is reading for a PhD in Medieval Welsh History. He’s a former pupil of Ysgol Gŵyr and comes from Swansea. He was cool about the experience of taking part saying: "Personally I enjoyed the free lunch." Daisy Le Helloco, who is 25 is also reading for a PhD, this time, in English Literature. She is a former pupil of Thomas Hardye School, Dorchester and comes from Dorchester. Anna Johnson who is 22 is studying an undergraduate degree which will lead to a Masters degree in Marine Biology, She is from Chippenham and a former pupil of Abbeyfield School. She said of the experience: "I spent the entire time staring at the big gyroscope which is part of the set." Reserve team member Tom White is 21 and studying a Masters research degree in Ecology. He’s a former student of Wayland Acadamy and Swaffham Sixth from college and comes from East Wretham, near Thetford, Norfolk. He said: "I'm a very important part of the team!"